There’s something about June … maybe that it’s the sixth month, so you have that reminder that the year is half over. Or maybe it’s the June sunshine (at least in my hemisphere) that makes you want to be ultra productive so you can sneak out for a before-dinner walk. In any event, I’m feeling rather conquer-the-worldish at the moment, and I hope you are, too. To help with that, here are our community prompts for June. Each month in 2017, we’re giving you a pair of prompts — one to make you more productive and one to improve your creativity or writing skills. You can jump in anytime — and let us know about your experiences in the comments! Last week I wrote a post about the two ugly problems that plague freelancers, especially when they’re starting out: the lack of clients and the lack of good clients. One solution to these terrible woes is to put a marketing system into place — a regular, consistent process you follow to find more of what you want. Your productivity prompt for this month is to decide on a day of the week and a time. Maybe it’s Thursdays at 10:00 a.m.
Then, every Thursday at 10:00 a.m., do one outreach task. 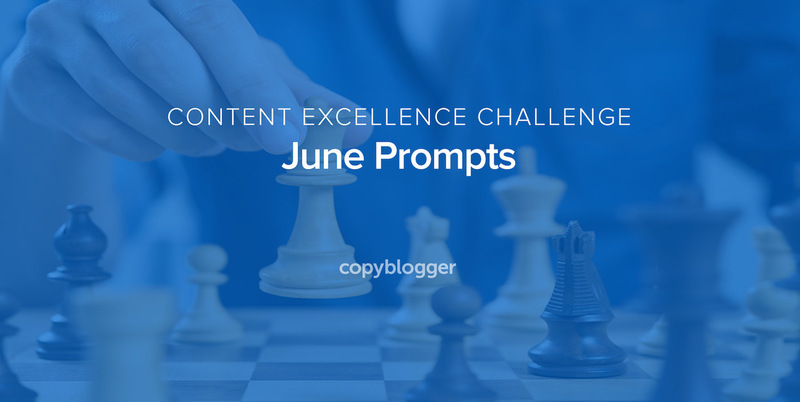 You might use June to experiment with tasks and find one that works for you. What’s an outreach task? It’s a repeatable process to find and connect with new people who don’t know you yet. The point is to make a weekly habit of reaching out to find your audience, rather than creating content and hoping someone stumbles across it eventually. I do have an ebook that could be helpful. It’s called Effective Content Promotion, and it’s free when you register for the MyCopyblogger library. If you’re in our Authority or Certification communities, we’ve also been focusing on outreach (Beth Hayden did an amazing session with us in late May), and we have more workshops scheduled with techniques that will help you actively get out and grow your audience. Outreach is often one of those tasks that lives outside our comfort zones, so it really helps to figure out precisely what you’re going to do, and then schedule a fixed time to do it at least once a week. We all have areas where we just don’t feel very strong. Like I mentioned above, cold-calling is one of mine. When I’ve needed to do it, I haven’t felt confident or capable — and it showed. This month’s creativity prompt is to invent an alter ego who’s great at the thing you’re not good at. You’re going to imagine this person as a character in a novel or a film. Know what they look like, how they talk, what they wear, where they live. Then, when you’re doing the challenging activity, you’re going to write as that character. You don’t have to be a fiction writer to pull this off. It’s much easier to do in writing than it is to try face to face or on the phone, although those are also options if you feel ready for Expert Mode. Are you too timid when you discuss your services with a client? Write a pitch using the voice of an ultra confident alter ego. Are you too blunt when you email colleagues? Write an email using the voice of a nurturing, benevolent earth mama. You don’t have to share what you write — but you may well find that you want to. When it’s time to be tough, or patient, or steely, or suave, it’s handy to have a well-developed alter ego who can handle those states effortlessly. Let us know how you’re doing with these! What kinds of outreach have you found valuable? And what will be your day and time to schedule them this month? What’s your alter ego amazing at? I pretty much do all the social media thingamajig, but setting a specific time? I never thought of that. But I’m definitely going to give it a go. As for the alter ego, I’ve also done that and it can be quite liberating: pretend you’re someone else – maybe even a celebrity – a speak in their voice. I’m going to do that again, as well. At this point in my life, I think one of the most useful accidents of my existence was doing theater when I was a teenager. I can pretend (even to myself) to be just about anyone, and that does come in handy. Cheesy as it may sound, I had considered taking acting lessons just to get better at sales and this type of thing. Never interested in actually acting, though. I’m not that cheesy. June really sparks me to get stuff done. I feel that with only six more months left of the year I really must achieve. Some really great productivity tips here. Might even give FB ads a chance. Great prompts. I’ve filled my June calendar of the ones I want to see accomplished. I can really recommend LinkedIn as an outreach method – as long as your messaging doesn’t come across as being ‘spammy’ or annoying. As you say, proposing a guest post can be really beneficial too. This was a great read, Sonia! I’ve been experimenting around with Twitter events for a few years. My current iteration is a coffee break for productivity and accountability. That’s 10 minutes at 10 o’clock Pacific every weekday. It’s quick. It’s focused. It’s fun. Anyone can join in. Just share your drink of choice for the coffee break. (Bonus points for pinging a brand. They love to play along.) Comment on the theme or quote of the day. Monday: Self-Care, Tuesday: Reading, Wednesday: Writing, Thursday: Business, Friday: Pau Hana. On Fridays, I create an archived digest of the tweets in Storify. In 10 minutes of tweeting and approximately 10 minutes of prep, I get to tick about 10 things off of my to-do list and create a space for others to do likewise. I will be pivoting to a mini podcast while maintaining the live tweets. The beverage and breakfast purveyors will be warm to sponsorship pitches. Bonus. What’s in your cup? Small talk.